Groups of volunteers pop up continuously. It’s an exciting and humbling by product of what we do. We appreciate it, we really do! You guys rock and make us feel proud of what you are achieving at local level. Volunteer photographers, videomakers, designers, musicians, journalist, and a whole bunch of other amazing people are all over Europe and at least three other Continents (by the way, do you know anybody in Antarctica willing to join ranks?). However, a certain level of organization is needed in order to achieve as much change as possible. Local groups with a strong leadership are stronger in their visual storytelling and can better interact with local realities such as small NGOs, groups of volunteers, local media, etc. We had a great time and we strengthened bonds that took us beyond the “professional” level. Friends can obtain much more. 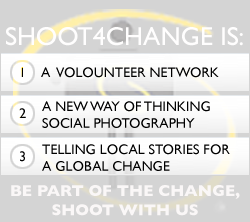 If you feel you’re up for this, drop us an email at s4c@shoot4change.net and tell us about you and what You would like to achieve in your town and we’ll decide together how to proceed. In the meantime, here are some of the more organized and active S4C Teams on the block. If you want to join their rank, write them and get in touch for a chat or coffee. It will be worth it! Great mind think alike…and shoot together!